Happy Kitchen Sink Stamps Monday! It's a Yee Haw! type of day in the kitchen this week, as Kitchen Sink Stamps releases new sets!﻿ Not only are there FOUR fabulous releases, but for a LIMITED TIME, FREE Shipping has been lowered to $45 (Free Shipping Special available the 18th/19th only). You can also save 10% on all your Kitchen Sink Stamps purchases when you click here then enter code LISA10KSS. I've created a few cards using this months release to share with you today - video tutorials coming soon! This one used the Multi Step Cowboy Boots and Multi Step Cowboy Hat. On the hat image, I cut the gloves off, and popped the image up on dimensionals. Those of you who frequent my blog, know I'm a big fan of the Warhol Technique and thought would be perfect for the Multi Step Cowboy Boots. This one was well liked by the boys in my house! ﻿﻿ ﻿﻿Thanks so much for stopping by, for more Kitchen Sink Stamps inspiration, be sure to visit the other Design Team Members. Your fabulous row of colorful boots looks just like every respectable Texas cowgirl's closet!! Sensational!! 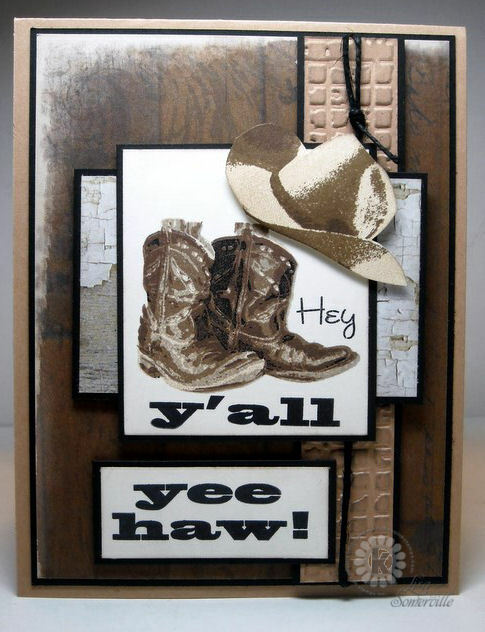 I love the wonderful card with the longhorn on the star with the boots!! Those cards are all fantastic, Lisa!! I see you cannot stop using the boots, hehe ;) Love the Warhol style card especially...gotta try for my boots too!! These are all wonderful but I really like the last one! You've done a nice job showcasing these new images! Wow, Lisa! I so love all three cards! I REALLY love the boots in all the colors...so fun! Yee Haw! Wonderful cards using these fun cowboy stamps. Love all the designs and fun layouts. 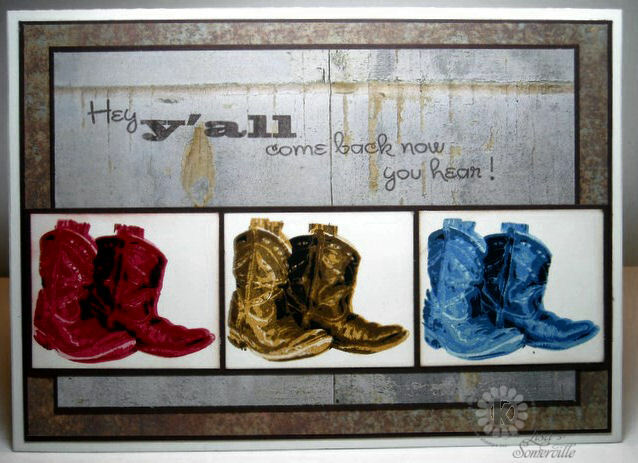 What a great variety of cards with this set, I do love the Warhol with the cowboy boots! These are wonderful man cards, great job! Great images. I love the Warhol technique with the boots.